Ever wanted to feel like you’re in a real-life Star Wars movie? Nothing screams “OUTER SPACE!” quite like laser tag, and no laser tag gun fits that bill more than the Titan! That’s right: this week’s Product Feature is all about our most popular indoor and nighttime tagger. Ok, I’m just going to state the obvious now to get it out of the way: The Titan looks awesome in the dark. 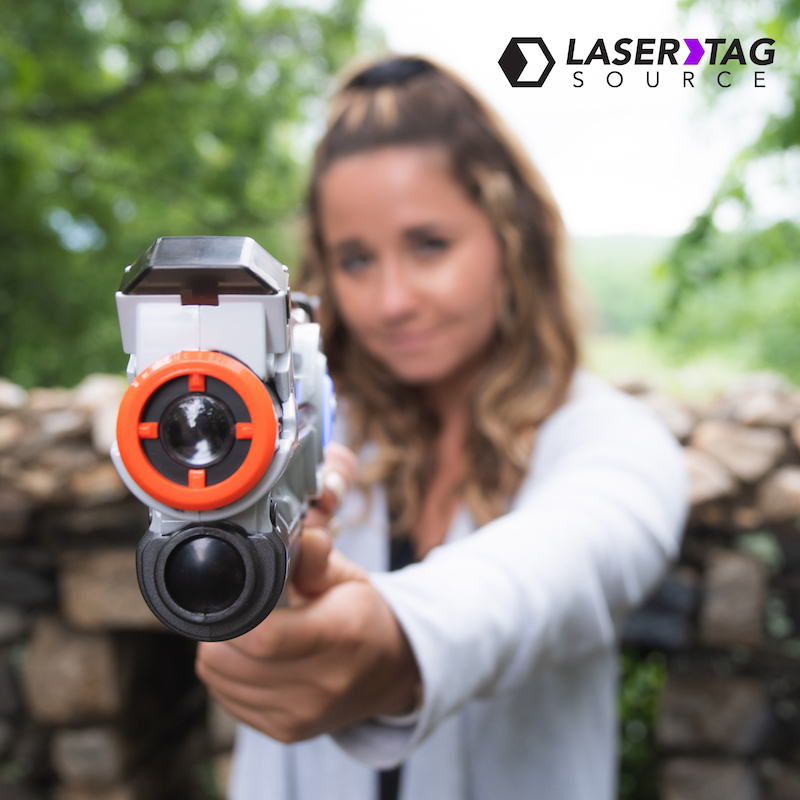 Whether you’re outside in the evening or having a classic indoor battle, this laser tag gun comes with some serious style. But, like most things, appearance isn’t the only thing that matters. From a performance standpoint, the Titan was made for the dark. So wait until the sun goes down to see what these taggers can really do! So what do you aim for? Easy! The sensor of the Titan is located directly underneath the barrel (though we prefer the term “Laser Barrel”). So just aim for your enemy’s tagger, and start lighting them up with lasers! That means you don’t need any additional equipment like headbands or vests to have an epic laser tag battle. 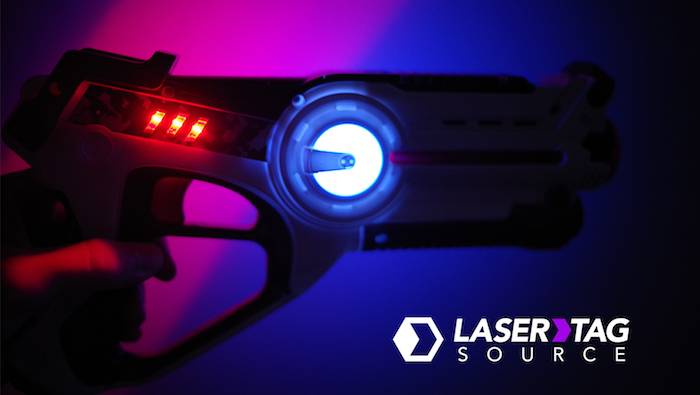 Good news: the Titan has some of the most unique features of any of our entry-level laser tag guns. Sure, it comes with your standard team deathmatch option. But the coolest thing about the Titan is its option to play with more than two teams. 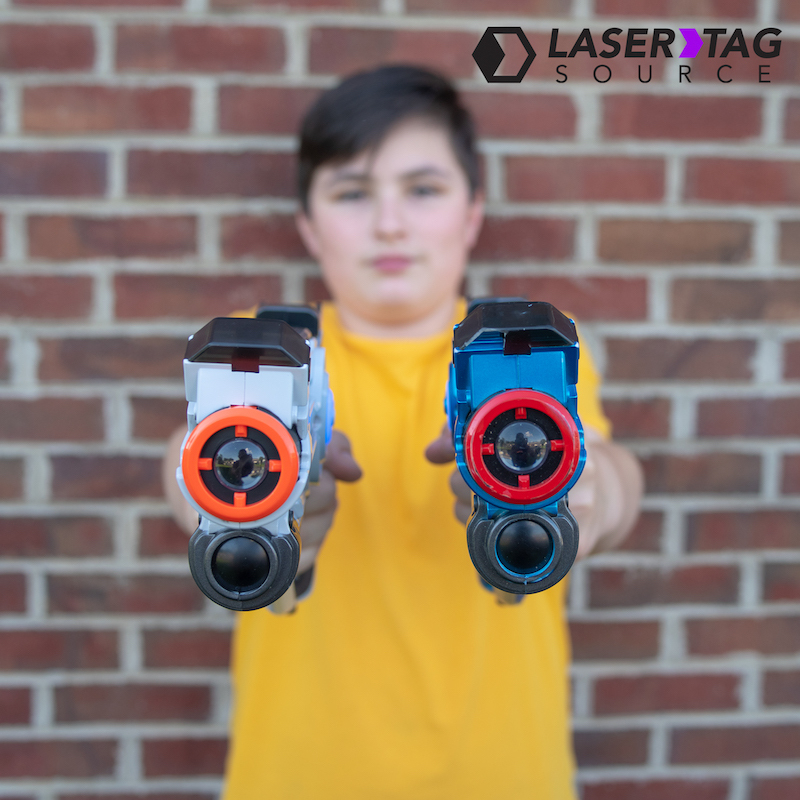 With up to four different team options, you can really add some variety to your laser tag matches. Tired of the standard laser tag gun with only one option for weapon style? Well the Titan comes with four! So whether you want to stick with your typical rate of fire or mix it up with a bazooka-themed option, you can choose the weapon that fits your playstyle! So how about the game time? Well, the Titan always plays with 9 lives per player. So game time just depends on how accurate you are with your lasers! If you’re a deadeye sniper, you might be able to eliminate your opponents within mere minutes. Some of the younger, inexperienced laser taggers may take a bit longer to determine who is the winner. The one guarantee is that you’ll want to take advantage of the rental and keep playing over and over. Perhaps the best news of all: the Titan comes in tied for our lowest price point of $12.99 per tagger. It is the perfect tagger for any age, as long as you are playing in the evening or indoors! Renting the Titan is quick and easy! Click that “Place Reservation” button at the top of the page and enter the date of your event and where you’re located to get started. We rent and ship nationwide, so as long as you’re in the United States, we’ll be able to ship you the fun!